Two Harbors’ First State Bank organized in 1902 in a simple frame building at 610 First Avenue (now the home of the Electric Shop and True Value Hardware). That first year the bank received just $29,000 in deposits and loaned out $25,000 of it. 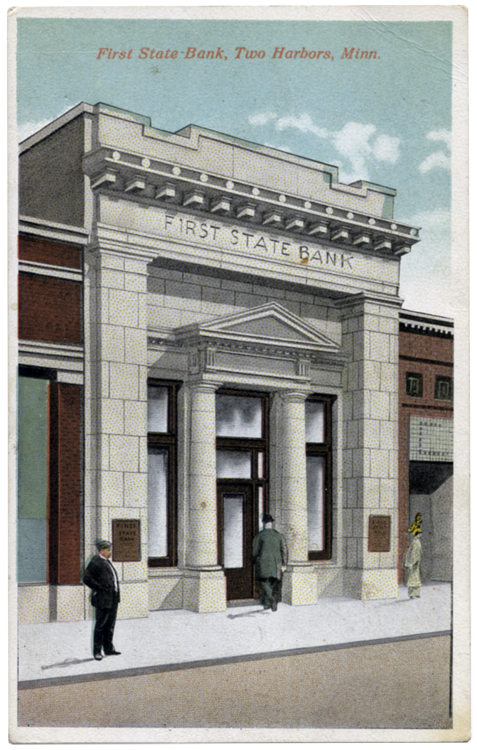 The bank’s owners built the Classical-Revival building at 622 First Avenue in 1916. In 1925 a unique protection system was installed in the bank’s vault: if would-be burglars attempted to blow the vault, poisonous mustard gas would be released to chase off the thieves. (More likely, it would have killed them: mustard gas is a chemical agent introduced into warfare by Germany during World War I—the Germans dispersed it as an aerosol in bursting shells. Actually a colorless liquid, mustard gas can blister skin, cause blindness, and if inhaled, cause pulmonary edema in the lungs.) Bank staff also installed a cylinder in the vault in 1928 so that if anyone was accidentally locked inside, food and water could be passed through until the safe could be opened. A national charter in 1925 changed the bank’s name to the First National Bank of Two Harbors, and it was sold in 1929 to the Northwest Bancorporation, which eventually developed into Norwest Banks, which in turn became part of Wells Fargo. Today the bank is a branch of Wells Fargo.